Playing roulette is easy and simple. You have to start the game by placing bet on roulette table. When the number of your choice comes up after spinning of the roulette wheel stops, then you will win the bet. 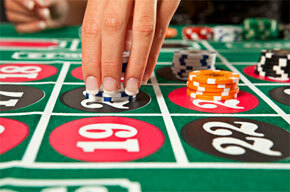 Roulette wheel consists of 38 pockets (in American version) with the numbers 1-36, single zero and a double zero. The roulette table will have these number printed on it and you place your bets on the numbers of the table. The small white ball will be rotating to the opposite direction of the wheel and the number on which the ball fall will win the game. The winning or losing of the game depends on the bets placed on the table. Type of the bet determined the amount of the win. Different types of bets are explained below. Only one number and payout is 35:1 and the chance of winning is 2.63%. To place this bet, you have to put the chip on any of the number 1-36, 0 or 00. The chip should be placed in the square without touching the lines. Two numbers are used and the payout will be 17:1 with a probability of 5.26%. Place the chips between the two numbers above the line. You will win the bet when any of the number comes. Three numbers are used and the payout will be 11:1 with a probability of 7.89%. You have to place the chip on the 3 numbers in a row and the bet should be place above the line that differentiates the outside and inside areas. Four numbers are used and the payout will be 8:1 with a probability of 10.53%. Place your chips on the intersection of the four numbers. When one of the four numbers comes up, you will win the game. Five numbers are used and the payout will be 6:1 and it is recommended that not to place this bet as the house will get an extra advantage of 2.5%. Six numbers are used and the payout will be 5:1with the probability of 15.79%. In this bet, you have to place the bet between two rows of three numbers which divides the fields of outside and inside.